This is an ideal image for any couple looking to have a winter wedding! Snow, when backlit as it is in this image, offers an amazing element of texture to any photograph. 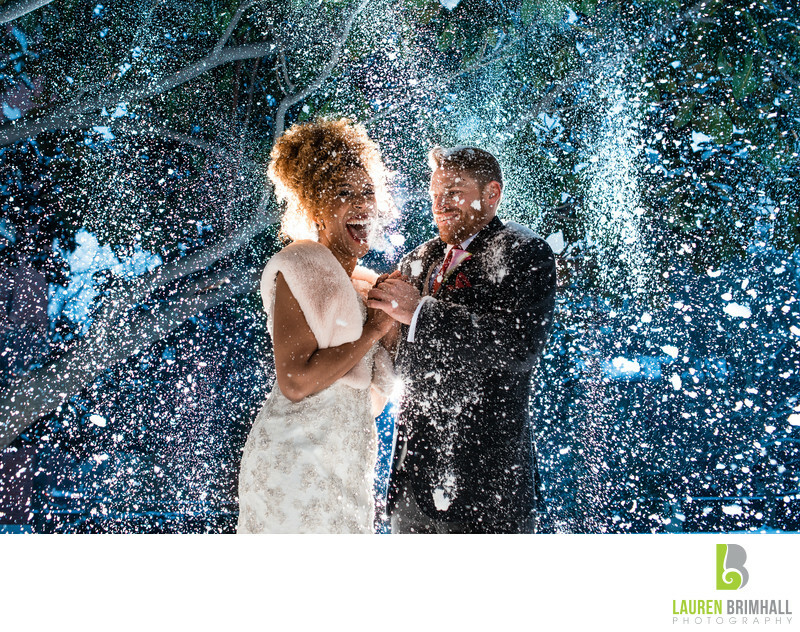 The couple’s expressions that depict being cold, excited and connected, however, bring this particular image to the next level. The bride’s breath can also be seen, showing just how subzero the temperature was on this particular snowy wedding day. Another unique aspect of this image, is that it wasn’t ACTUALLY snowing when the shot was taken, but it had snowed quite a bit earlier that same morning. While taking another photo nearby, the photographer noticed there was snow blowing off a particular tree in the background, and had a stroke of genius. She asked the couple if they would be on board with standing under the tree, as the second photographer shook the branches above in an effort to have snow actually falling on them for one image. Neither the photographer or the couple expected such HUGE amounts of snow to come down at once, hence their extremely “cool” reactions. This photo was taken within walking distance of the couple’s venue, The Hotel Monaco located in Philadelphia, PA. It was conceived after exhausting all the typical wedding locations nearby, such as the First Bank of the United States and the adjacent park in Old City, as the photographer was looking to do something different, and really capitalize on the freezing cold, December weather that day.